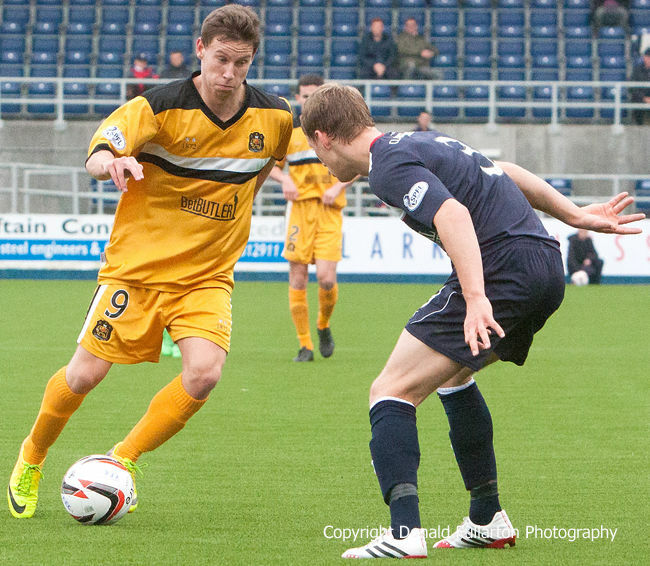 A FIGHTING performance by Dumbarton gave them a narrow victory over Falkirk on a dreich afternoon at the Falkirk Stadium. Some 2,700 watched a hard-fought encounter in which a below strength Dumbarton, missing several key players because of injury or suspension, battled hard. From his seat in the directors box manager Ian Murray saw his side take an early lead when a thundering shot by Jordan Kirkpatrick was diverted into the net by Garry Fleming. The home side fought back, but found the Sons defence in determined mood. Midway through the half it was 2-0 when a perfect cross by Paul McGinn was flicked into the net by Mitch Megginson, but before half-time the Bairns pulled one back with a superb shot into the top corner by Phil Roberts, who was later to be red-carded. After the break it was backs to the wall for Sons as a rejuvenated home side threw everything at them, but the closest they came to a goal was when a shot hit the bar. A great defensive effort — with centre half Aaron Barry in top form — gave Sons a deserved three points. The picture shows Mitch Megginson taking on a defender.